It's a very slight difference, but if we're going to trust the numbers it appears that Payton probably made the right decision. These results hold up throughout the length of field, so it's not a quirk of being near a team's own 20. But it's close enough to be near the point of indifference (which would generally be a 2nd and 4 on a 6-yd gain). The results go against my intuition, and I'm not sure why 2nd and 3 plus 2 yards beats a 1st and 10--it just does. The takeaway here is just that Payton didn't make a mistake. I know some readers who aren't familiar with EP might think it's some convoluted black box statistic, but it's simply the average net point expectancy given down/distance/yd-line situations. It's smoothed to filter out the noise, but that's all that goes into it. Different implementations can have slightly different values depending on what data they include, but the slopes are the generally the same, which is a key consideration. EP is usually only useful in comparison to another EP value, such as the difference between the EP at the snap and the EP at the whistle, which gives us EPA. Or in this case, the important thing is the comparison of the results of an option to decline a penalty. Expected Points is based on historical performance of teams in that down/distance, correct? I wonder if the results are skewed slightly by the fact that teams that gain 7 yards on first down tend to be teams that will score more points per drive? Obviously having a first and 10 tells us nothing about the performance of a team since every team's set of downs starts at first and 10. Take, for instance, a 2nd and 3 from a team's own 20 yard line. This gives an EP of +0.46. Now, look at a 1st and 10 from the 23 yard line - essentially the team from the previous play got just enough for a first down. The EP is the same in this situation at +0.46. Basically the EP of this drive remained unchanged despite (what most would consider) a successful play that gained a first down. Now perhaps those two field positions are essentially equivalent for all teams and my theory is incorrect, but it's something to consider. Could the 2nd and 3 be better because there's a greater chance of getting a first down than on a 1st and 10? Seems like a pretty high probablilty of making a 1st down with 2nd and 3 . The Keith. I edited the OP. Should have consulted with you prior. May also just have been strategery in that you can open of more of the playbook on 2&3. i.e. defene has to respect a short run or taking a shot deep since a favorable 3rd down is in hand. I wonder if the cause is due to the number of first downs needed to score. Example 1st and 10 on 30 yd line vs 2nd and 1 on 29 yd line. Converting a 2nd and 1 shoyld be highly likely, and when you do convert you will probably have the ball 1st and 10 at the 33 yard line rather than the 30. Just a thought anyways. I'm thinking the same thing regarding the playbook...2-and-short is a great place to be regarding play selection. Perhaps teams in that situation just tend to get further down the field than the 1st-and-10. Basically the same view as anon, also. Average gain on 1st down is a little over six yards. Take the penalty and (on average) after one play you're looking at 2nd-and-4 from the 27 as opposed to 2nd-and-3 from the 23. Further downfield, but worse down-and-distance. Many OCs like to pass on 2nd and short, since it leaves them a makeable 3rd down. More passing usually equals more points. Where does El Muenco's "Average gain on 1st down is a little over six yards" come from? When I try to calculate the 2013 average across the league I wind up with 5.42 (and 5.41 in 2012). 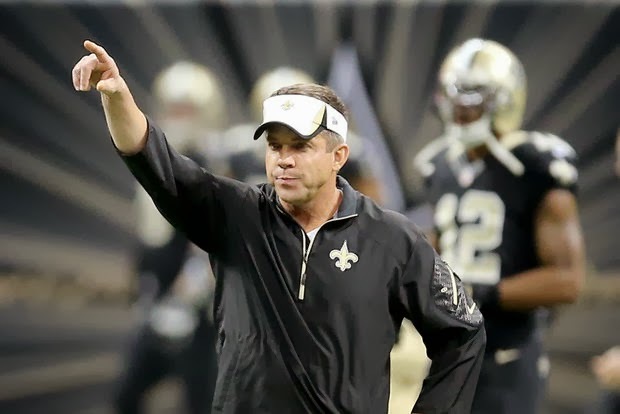 Actually I think Payton DID make one misstake in this situation. But it was not in declining the penalty. Neither do I think accepting it would have been a significant mistake. But it seemed to me that he let the whole procedure take a lot of time with the referee explaining etc. And in general during a drive once started any significant break in "rythm" (for lack of a better word) favors the defence in my opinion. Not sure if anyone has done any studies of this? Most recent Anon, you have an interesting idea but tough to test, I think. Most play-by-play data won't have real time elapsed between plays, but rather clock time elapsed and you are asking for situations in which real time but not clock time has elapsed. You could also check plays after a review or a timeout, but those might be problematic. The review flag might be thrown or the timeout called specifically because the coach in question feels slowing things down at that moment would benefit his team. We'd hope (for the coach's sake) that the coach would be right at least more than half the time, prejudicing the results. And if you break things apart into challenges/timeouts by offense or by defense, then each of your two bins will be corrupted in opposite directions. Another option would be reviews ordered by the booth, but all those by rule only happen either at the end of a drive (auto-review after turnovers or scoring plays, and this rule is new anyhow, making the data anything but robust) or in the final 2 minutes of a half, which is not usually the best time to test out hypotheses, since time pressure is affecting the "offensive flow" or lack thereof. Again, small sample size likely an issue here as well. Seems to me that you are kind of asking about "in-drive momentum" which almost belongs in Brian's part 4 momentum article. Since to me, that is almost surely the same thing as an offense being "in rhythm." Even if distinct, it is similar to this weird creature of momentum in that intuition suggest to us while watching a game that they exist at times, but we find them tough to define and when we try to measure with data we are left with the distinct impression that these "mystical forces" are really signal-less noise into which our right brains want to impose signal. The Win Probability Calculator does bear out that EP is better with 2nd and 1 from your own 29 or 2nd and 2 from the 28 than with 1 and 10 from the 30. Is there any evidence that coaches realize this and intentionally call plays on first down which are designed to result in 8-9 yard gains instead of getting another first down? Rog, you are kidding right? please tell me you are kidding.